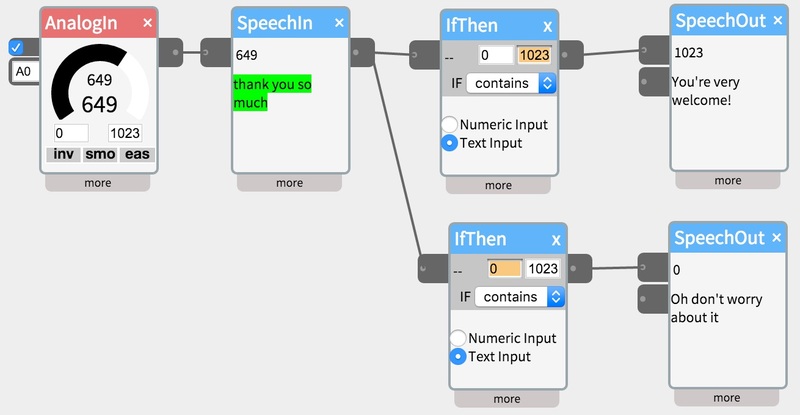 The SpeechOut widget receives text and performs speech synthesis to output audio. It supports multiple voices and languages. Connect the trigger input to the first inlet. When the value from this input goes above the threshold, speech synthesis will start. When the input value goes below the threshold, synthesis will stop only if autocancel is checked in the more section. Connect optional text input to the second inlet. Text received from the second inlet will then be synthesized, either when the input in the top inlet goes above the threshold, OR immediately when text is received if the autoplay checkbox in the more section is checked. voice – sets the voice to be used in speech synthesis – note that specific voices are required for many languages. autoplay – when checked, speech synthesis will start immediately when text is received by the second inlet. autocancel – normally, the widget will speak the entire text, even if the first input drops below the threshold. if autocancel is checked synthesis will stop immediately if the input drops below the threshold. text box – this is the text to be synthesized text. You can manually edit this, or it will can be set by sending text to the second inlet. Set the level of the input above the threshold and speech synthesis will start. This example patch shows how multiple SpeechOut widgets can be used to generate varied responses to inputs. It uses the SpeechIn and IfThen widgets.